This question is related to the question I asked previously: Why was the shape of German states pre-WWII (especially Prussia) so complicated? Most maps of pre-WWII are not detailed enough to see an exhaustive list of enclaves and exclaved territories. Only the major ones are visible. For example, the municipality of Achberg (today in Baden-Würtemberg) was an isolated exclave of the Hohenzollernsche Lande, itself an exclave of Prussia. However, since this exclave is so small it cannot be seen on maps containing the entire country. I suspect many municipalities were in similar cases. Where can I find a complete, exhaustive list of all territorial irregularities of pre-WWII Germany? Here's a zoomed-in screenshot of a map I made using Harvard's Geospatial Library. 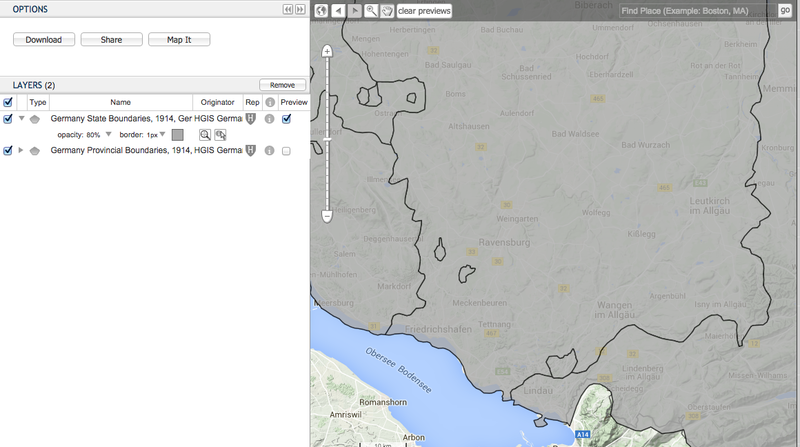 As you can see in the left, the layer I chose was "Germany State Boundaries, 1914." The little exclave in the bottom center of the screen is Achberg. If you zoom in a little more, it is labeled, but I chose to stay a little further out so you could see the other exclaves. It's possible there are other map layers that better suit your purposes. There are many, many layers available for Germany, though 1914 is the latest year I found. There is a detailed administrative map of the German Empire on Wikimedia, and most small exclaves, such as Achberg, are visible, and their colour helps to see exclaves of which state they are. It is possible some of the smaller exclaves (smaller than a village) are not directly visible, but combined by Two Shed's answer, it should be possible to make an exhaustive list of all exclaves. Many old, detailed and topographics maps of Germany are available on Günter Mielczarek's website. They are fantastic scans of the official maps back then, and are detailed, showing former border between states. Not the answer you're looking for? Browse other questions tagged germany maps political-geography resource or ask your own question.